This is a fundraising event and new season gathering at the Lion and Swan. Fabulous prizes are up for grabs and friends and family are more than welcome, so spread the word! Tickets are available at rehearsals and on the door. Tickets are £5 (Includes 5 Raffle Strips for betting). Rehearsal - Full call. Run Act 1 so far. Followed by Christmas Social. This year our Christmas Social will be held at DV8 on December 18th. Pop along to the last rehearsal of the year before heading down to DV8 for a festive knees up – the perfect opportunity to socialise with the new people you have met at Trinity. Please feel free to bring along friends and family. A judged bake off competition, tombola, raffle, Bric-A-Brac and of course tea and coffee at Congleton Library. Live music from Hazzard plus special guests! This has been an incredibly popular night for the last 2 years. Now at a brand-new venue, his year's gig falls on Valentine's Day and promises to be the best yet!!! Tickets are £5 and will be available from rehearsals, Reuben's and Illucini's. The event will start at 8pm with Hazzard first performing around 9pm. Sit back and relax at The Young Pretender and enjoy some free popcorn whilst watching the 2005 film of The Producers. The film will be followed by some live performances from the cast. We are holding our annual Trinity Summer Barbecue on the 27th June. Tickets are £5 (pay on arrival) which includes initial food and a drink. The Cocktail bar makes a welcome return this year with the addition of some special summery Pimms creations. The Barbecue starts at 3pm at Brackenridge, Congleton Edge. This isn’t just for members so feel free to tell your family and friends. More details can be found on our Facebook page here. 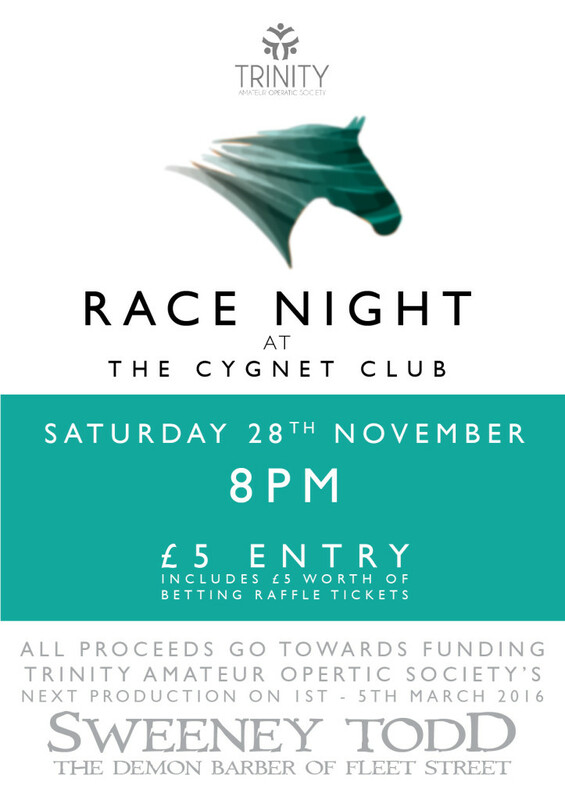 The Trinity Race Night returns! This years event is at a new location - The Cygnet Club, Congleton - on Saturday the 28th of November at 8pm. Fabulous prizes are up for grabs and friends and family are more than welcome, so spread the word! I'm sure those who attended last year will agree that it was great fun! Tickets are available at rehearsals and on the door. Tickets are £5 (Includes 5 Raffle Strips for betting). Trinity Amateur Operatic Society present, Sweeney Todd's Pie Night at The Young Pretender. This is a special "Preview Evening" of our next production, Sweeney Todd: The Demon Barber of Fleet Street. Come down and meet the cast plus enjoy live performances from the show. The Young Prentender have a great menu including some delcious pies plus an amazing selection of beverages. What's more, this event is FREE! We look forward to seeing you all there. Live music from Hazzard plus special guests! This has been an incredibly popular night for the last 3 years. Now at a brand-new venue, this year's gig promises to be the best yet!!! Tickets are £5 and will be available from rehearsals and The Cygnet Club. The event will start at 8pm with Hazzard first performing around 9pm. The Entertainment Quiz also makes a return (£5 per team) and is sure to test your music and film knowledge, with great prizes on offer. Sweeney Todd: The Demon Barber of Fleet Street follows Todd (AKA Benjamin Barker) as he returns to London as a convict from Australia seeking revenge against those who separated him from his wife and child. After setting up business as a Barber above Mrs Lovett’s failing pie shop, Todd’s lust for revenge quickly leads to murder. Prompted by Mrs Lovett, his victims become fresh ingredients for her pies, which boosts sales and inevitably leads to the tragic conclusion. Featuring one of Sondheim’s darkest and most intricate scores, from the opening chords of the organ prelude to the chilling sound of the factory whistle, the mood remains atmospheric through the choral sounds of ‘The Ballad of Sweeney Todd’ to the more intense ‘Epiphany’. The lyrics are witty and exciting, with comic songs such as ‘By the Sea’ and ‘A Little Priest’ lodged firmly into the musical theatre repertoire. A randomly generated password will be sent to your emial address (You can change this later). If you don't appear to receive the email, check your spam folder.